When it comes to toys in this day and age, if you have ever taken time to look at them, you’ll probably say to yourself “why didn’t they have toys like this when we were younger?” Seriously, there is no denying the fact that there are some pretty amazing toys out there. In fact, they’re so cool that many of us adults may find ourselves playing with them, without even realizing we are playing with a child’s toy. This year, at the toy fair, which was held in New York, we witnessed a wide array of toys being introduced. One of the toys that we would like to introduce you to today is Jakks Pacific’s Little Mighty Gym. Before we purchase something, we personally like to read about the company to give us an idea of what they’re like. For this reason, we would like to take a brief minute to tell you about Jakks Pacific, Inc. This is an American company that designs and markets toys and consumer products. The company is named after Jack Friedman, who is the founder. Jack Friedman presided over the company until he passed away in May of 2010. Jakks’ is a company that is known for producing electronics, action figures, dolls, role play dress-up, Halloween costumes, vehicles, kids furniture, art activity its, plush, infant//preschool items, seasonal products, pet toys and construction toys. They are a license of sever hundred trademarks including Nintendo, Disney and Star Wars. So what you have here is obviously a company that knows what they’re doing. What is the Little Mighty Gym? The Little Mighty Gym is a toy designed for kids from Jakks Pacific. This “toy” makes it possible for children to challenge themselves physically via games that pop up through the screen of a mobile device like a tablet or iPhone. Mind you, a mobile device is not included with the gym toy – that is something you will need to purchase separately, or if you already have one, you’re in luck. You will be using the mobile device as a screen with which video game-style sporting events will be held. Kids are going to have the opportunity to take part in a variety of virtual courses. As we said, there are a variety of virtual courses your kids will have the opportunity to take part in. Some of those courses include track and field courses, a pretty cool zombie escape and running trails. This “toy” is shaped like a workout machine, so the child will feel as if they really are working out (they really are). 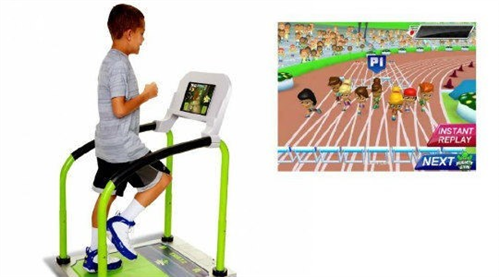 The toy slightly resembles a treadmill. Kids can run and jump their way through the challenges on it. There’s characters that they can customize in a way so that the virtual players resemble their likeness. Jakks Pacific’s Little Mighty Gym will be a whole lot of fun for the little ones. If you’re looking for the type of toy that will get that little one moving around, then you’re looking at it right here. The Little Might Gym will make exercising a breeze!